Do you need a way to document your use of formative assessments and their impact on your lesson planning? We have you covered with this easy-to-use template. Perfect to prepare for your evaluation, providing information for your administrator. 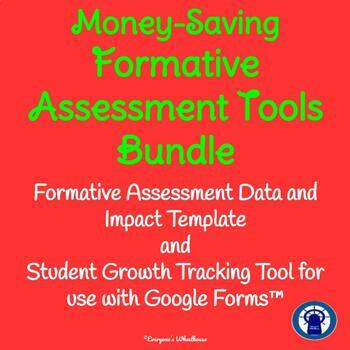 Save money with this formative assessments tools bundle. This is an excellent tool for student self-assessment using the Marzano or another growth model (for use as a Google Form). We have used this with our students for several years with excellent results. Our students start the tracker during the first minutes of class, while attendance is taken and other necessary tasks are completed. We provide the students with the learning goals for the day, and they get started on the trackers. They fill in their names, the date, and the learning goal, along with the type of lesson that is planned for the day. If new information is included in the learning goal, the students complete an initial self-assessment using the learning scale (a starting point for demonstrating growth when using this as a formative assessment). Following the lesson, as a closure to the class period, students complete the rest of the form. They indicate what they have done during the class period to work toward mastery of the learning goal. They self-assess, using the learning scale, following the day’s lesson. They are asked to explain their answers and to provide a plan for growth if their self-rankings are levels one or two. The form automatically directs students to the next section based on their answers to various questions throughout. Our students quickly adapted to the trackers as a part of the daily expectations. You may share the data collected with students by going to “settings” at the top of the form (the wheel symbol) and checking the appropriate box on the “general tab.” You may also change settings on the tab for email requirements and the number of responses allowed. On the “quizzes” tab, you could add point values. We assign these through Google Classroom and give daily points for their completion. Once you have responses, you may choose to view summary responses and/or individual responses, and you may also download the responses to a spreadsheet. That information will appear at the top of your form after there are responses. We use the data with our students to celebrate student achievement, with our administrators to document student growth, and as a formative assessment to drive our instruction. We provide you with the link for your own copy of our Google Form to use with your students. You simply need to be logged into your own Google account.